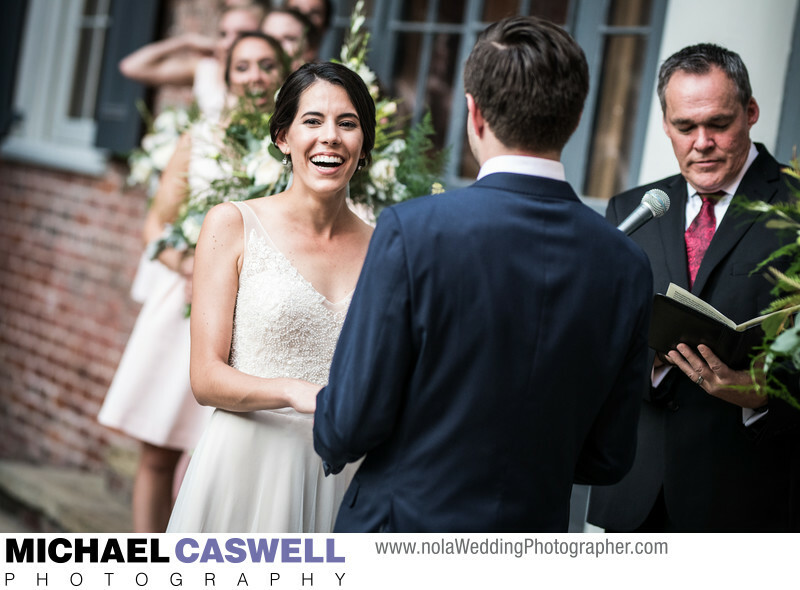 This wedding ceremony took place in the beautiful courtyard of the Hermann-Grima House. This courtyard is ideal for weddings, as it features a long brick-paved walkway through the center leading up to the house, where ceremonies typically take place at this venue, making for very nice photographs of the processional. The fabulous reception was held in the adjacent Broussard's Restaurant courtyard. The front entrances to these two venues are actually on opposite streets, but their courtyards are located back-to-back and share a common wall, with a gate allowing easy access between the two. Both venues are capable of hosting a ceremony and reception by themselves, but splitting up these two portions of the event eliminates the need for a single space to be reconfigured for the reception. However, another great way to address this problem when having a ceremony and reception in the same space is to have a Second Line parade through the French Quarter immediately after the ceremony, which gives venue staff time to make the necessary changes (and is an amazingly fun and memorable thing for you and your guests as well!). Location: 820 St Louis St, New Orleans, LA 70112.